Puppies teethe for about six months. 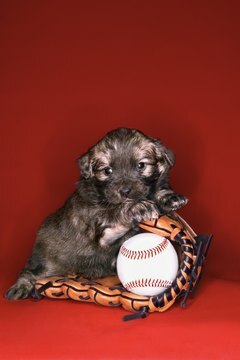 Handbags, shoes and even that report you have due are just a few items your puppy loves to chew. Puppies are notorious for shredding, gnawing and destroying anything within their reach. To stop a puppy from chewing, plan on exercise, alternate choices and lots of supervision. Determine why your puppy is chewing. If he is under 6 months old, he may be satisfying the discomfort of sore gums. Pups become lonely and bored, as well. Soothe your puppy's gums. Frozen wet washcloths can help as well as ice cubes. Provide him with plenty of chew toys to help ease the soreness. Walk your puppy every day. If you can, walk him twice a day. Puppies have tons of energy and walking will help tire him as well as relieve pent-up energy that could lead to destructive chewing. Provide your pooch with acceptable items to chew. Give him hard rubber balls, nylon bones and squeaky toys. Avoid giving him an old pair of socks or a discarded shoe. This will confuse him, and he will think it’s acceptable to chew all shoes and socks. Teach him not to chew your items. If you catch him, say "no," and give him a chew toy instead. Don't shout and don't scold. This will only make him nervous. Place him in his crate when you're not going to be home. He shouldn't be in a crate any more than one hour for each month of age. Make sure he has water and toys. Always take him out to potty before putting him in the crate. Block off an area for him. This should be a place where you can see him, but he can't get to your prized possessions. Apply bitter spray to the furniture. It's available at your pet store and will not harm your pooch or the furniture. Keep your items in closets or on high shelves that the puppy can't reach. Close doors. Get on your hands and knees so you can see things at your dog's eye level. This will help you spot cords that he can reach. Keep your pup busy by playing fetch or providing him with toys with hidden treats. Praise him when he chews on acceptable items. If he consistently chews on something he shouldn't, don't yell. Remove the item or place it somewhere else. Even moving a piece of furniture may stop him from chewing the legs. Can Puppies Eat Chew Sticks? Can a Puppy Chew on a Tree Stick?